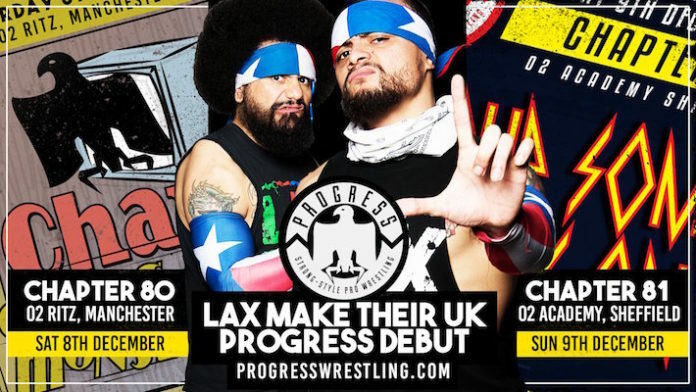 PROGRESS Wrestling has announced that LAX will be heading to the company in December. The company will be holding a weekender of events on Saturday December 8th and Sunday December 9th. This will be the UK PROGRESS debut for the team. Santana and Ortiz had an incredible bout against Chris Brookes and Jon Gresham as part of the United States Coast to Coast tour back in August. The New York City stop of the tour featured the match that many fans have described as the best ever tag bout in PROGRESS history. Chapter 80: Gods And Monsters and Chapter 81: Pour Some Progress On Me will be two of the biggest outside London for the company this year. The company recently held a mega event in Wembley Arena that drew the biggest crowd in English wrestling for 30+ years. Headlined by an incredible bout between Tyler Bate and WALTER for the PROGRESS World Championship which is available to view online in its entirety for free.